When it comes to buying toys for kids, most parents prefer to go with a brand they know, trust and love. It gives them peace of mind knowing that the company have been around for years and have a very good track record. Melissa & Doug are one of those popular brands, and parents of one year old toddlers love buying their toys because they feel the company provides quality toys that are fun while keeping safety in mind. But there are so many choices that it can become overwhelming. That’s where we can help. After extensive research, our team have put together a list of the best Melissa and Doug toys for 1 year old boys and girls to make your shopping experience so much easier. You can trust that we’ve done our due diligence and thoroughly checked each selection to ensure it met our strict criteria for inclusion on our list. We hope you find the perfect Melissa & Doug toy for your child’s First Birthday, Christmas or any occasion! The Melissa & Doug Toolbox Fill and Spill Toddler Toy With Vibrating Drill is the perfect birthday or Christmas gift idea for your 1 year old builder! It comes with 9 pieces, including a saw, a hammer, nails, a screwdriver, screws, 2 blocks, and a drill, all neatly packaged in a plush toolbox with a ruler handle. The cute toolbox has see through panels and the ruler handle is numbers so your toddler can learn their numbers and how to count. One of the wow factors for one year olds is the drill because it vibrates and has a pull cord for added fun and excitement! 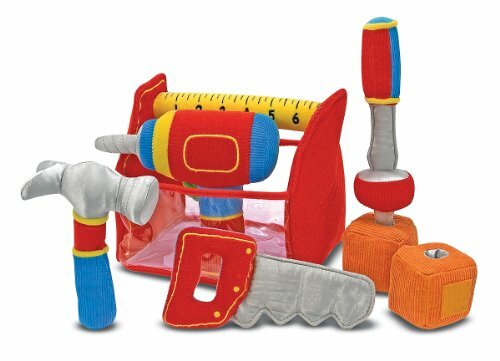 The tools and toolbox are made from a soft plush material, while the blocks are covered in corduroy, making all of the pieces very safe for your child. Because of this, your child gets to experience all kinds of different textures which is great for their development. This is a wonderful engaging Toy Toolbox from Melissa & Doug made from high quality materials for any toddler who loves pretend play and it’s perfect suitable for girls as well as boys. Several parents shared that the drill was their kid’s favorite tool and best of all, it doesn’t need batteries! Your child just pulls the cord, and the drill will vibrate! One year old toddlers love this toy toolbox with tools for them to play with and have fun! 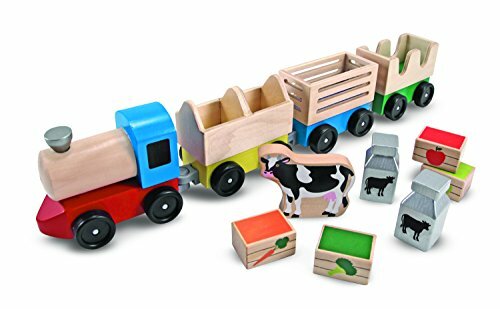 This Melissa & Doug Wooden Farm Train Set is a wonderful toy for 1 year olds who love trains and farm animals because with this set, they get the best of both worlds! Your child will get a cute toy train with 3 little cars that all link together. In addition, they will also get a cow, 2 x milk cans, 2 x fruit boxes and 2 x vegetable boxes, all of which they can transport in the train cars. This is a wonderful toy for encouraging your child to engage in imaginative play as they pretend they are taking the cow to market, or delivering the fruit and veg to a neighboring town! There is really no limit to all the different stories and scenarios that your toddler will come up with when playing with this Wooden Farm Train Set. The entire set is very colorful and eye-catching, designed to captivate and hold your child’s attention. A number of parents shared that this Melissa and Doug Farm Train Set was a huge as a First Birthday gift and their child continues to play with it for long periods of time. Toddlers love this wooden train set and have hours of fun loading and unloading the cow, fruit and veg crates and milk cans! 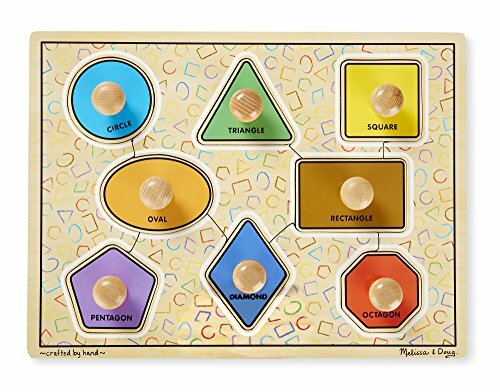 If you’re looking for a wonderul fun and educational toy for your 1 year old, then the Melissa & Doug Large Shapes Jumbo Knob Wooden Puzzle could be a good fit. Toddlers love to be challenged and what better way to challenge them while holding their interest and keeping them engaged than a fun puzzle! This beautiful and colorful wooden puzzle is all about geometric shapes and it has 8 pieces for your child to manipulate. The shapes include a circle, a triangle, a square, a rectangle, an oval, a pentagon, an octogon and a diamond! 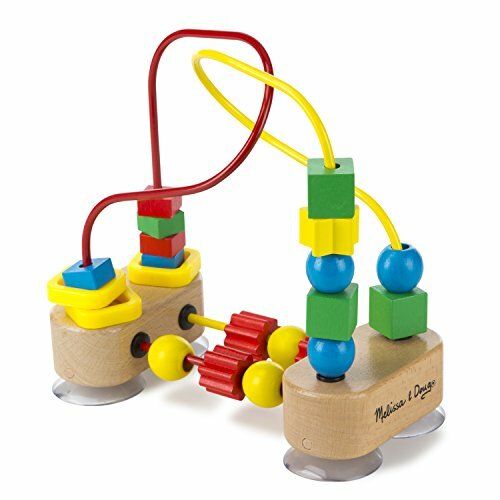 Each piece has a handy wooden knob for your one year old to grasp to make it easier for them to pick up a piece and move it into the right place on the puzzle. To help them learn which piece goes where, underneath each puzzle piece is the matching color and name of the shape. A number of parents shared that while it took their kids a while to figure out which piece went where, when they eventually did work it out, they clapped excitedly and were thrilled with themselves! The Melissa & Doug K’s Kids Teddy Wear Stuffed Bear is a wonderful educational and fun toy for 1 year old toddlers to teach them all about self care. Teddy Wear comes dressed in a cute dungaress outfit that your child can remove. The outfit has a zipper, pockets, buckles, and velcro straps and more for your child to manipulate. As well as that, Teddy Wear comes with a cute pair of shoes that your toddler can lace up or untie and remove. 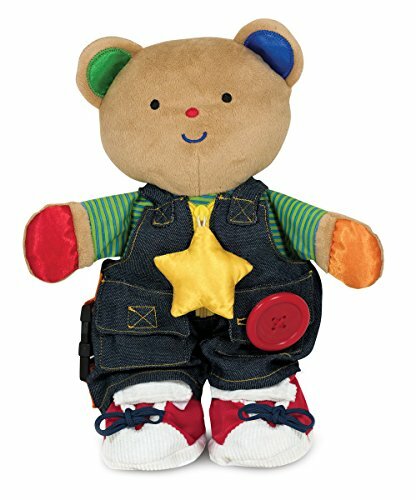 Through playing with this Melissa & Doug Teddy Wear toy, your child will start to explore the buckles, fasteners, buttons, pockets and more and will eventually figure out how they work. This will very much help them with their own clothes and shoes, as they will gradually learn to use a zip, tie their laces, open and close a button, and so much more. In doing so, their confidence and self-esteem will be boosted and it will help them to grow and develop. But more importantly for your one year old is the fact that Teddy Wear will become a very special friend that they will want to take with them everywhere. They will bond with this super cute Teddy. A number of parents shared that they were very impressed with this the quality of this teddy bear and that their kids loved playing with him. They also shared that they bought it for boys as well as girls and both bonded with Teddy Wear quite quickly. Kids just love this adorable Teddy Wear bear and have great fun playing with him! Lots of things for your toddler to explore: zip, laces, buckles, velcro straps, buttons and more! The Melissa & Doug Mine to Love Jenna 12″ Soft Body Baby Doll is the perfect First Birthday gift for any 1 year old toddler girl! 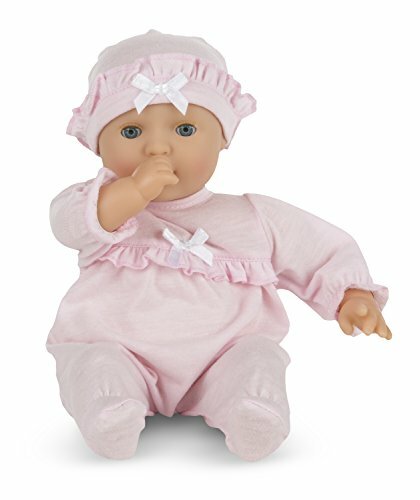 This gorgeous doll comes with a removable pink romper outfit and matching hat. She has the cutest baby cheeks, is very lightweight, has a soft cuddly body and is perfect for your little one to carry around. Her arms rotate and her eyes close when your toddler rocks her and puts her down to sleep. Then when she picks her ope again, her eyes will open! Your little one year old can comfort Jenna by putting a pacifier or thumb in her mouth! How cute is that! Several parents shared that this Melissa And Doug Jenna Mine To Love Doll quickly became a firm favorite with their toddler and that it was the perfect size for their one year old. Beautiful First Birthday doll for toddlers who quickly fall in love with Jenna! The Melissa And Doug First Bead Maze is a fun and engaging toy for any 1 year old boy or girl. Measuring 8.5″ X 7.5″ with multi-colored beads that your toddler can move over and back across the yellow and red wires, this bead maze toy will hold your child’s interest for long periods. There are 18 wooden beads and they are different colors, sizes and shapes. Also, there are 3 plastic spinning rings for your child to play with. Your toddler will have great fun sliding the beads along the wires and spinning the rings and watching them go! A number of parents shared that they take this Melissa And Doug Bead Maze with them when they go to eat out as it keeps their one year old toddler amused and entertained so that they can all enjoy a nice evening. Kids just love spinning and moving the beads along the wires! The Melissa And Doug Kids Pull-Back Vehicle Set is a soft toy set designed for fun loving 1 year olds and up. 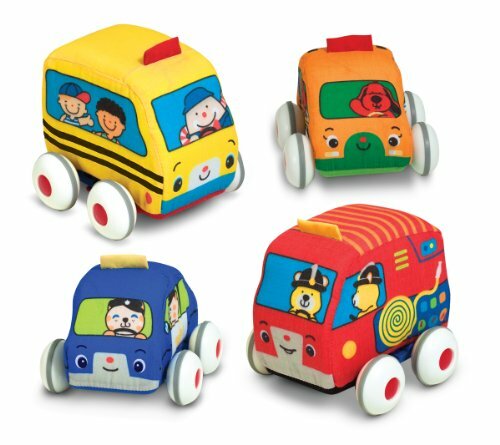 Your toddler will get 4 soft fabric vehicles including a car, a fire truck, a school bus, and a police car with a lovely carrying case for storing them safely. Think of the fun your child will have pulling back each vehicle one by one and watching them fly across the floor at speed! The 4 vehicles have cartoon style characters inside to really captivate your child’s attention and each vehical has wonderful vibrant colors that really catch the eye. The wonderful thing about these Melissa and Doug Pull Back Vehicles is that they encourage children to engage in role playing and imaginative play. Your child can prend to be a race car driver zooming along a track, or a policeman chasing the ‘baddies’, or a school bus driver taking children to school, or a fireman on his way to save lives and be a hero. There really is no end to the types of storytelling play your one year old can engage in with this set. While it is a perfect toy for your child to play on their own, it’s even better fun when they share it with a toddler friend as they can race each other for more laughter and fun! You can remove the wheels as they are held in place with velcro, and when you do, you can pop the soft cloth vehicles into the washing machine to keep them clean. This cool and cute soft vehicle set is the perfect First Birthday gift for any toddler, boy or girl, and fits their tiny hands perfectly for tons of fun! Several parents shared that while their 1 year old loved it, they had to admit that they themselves enjoyed playing with them too! Toddlers just love these cute soft care and have great fun playing with them! Your toddler will quickly learn that pulling back each vehicle and then releasing it will sent it racing at speed across the floor! This Melissa And Doug Alligator Walker is a wonderful eye catching wooden walker for children 12 months old and up. Your toddler will just love all the little details on this push toy that are sure to capture his or her attention. There are different colored fish on each of the wheels, spinning butterfly and ladybug wooden beads on the support, and and beautiful cattails on the upright supports from the base to the handle. But of course the mose eye-catching part of this beautiful walker is the 3 green alligators ready to chomp at anything in there way! As your toddler pushes the walker, the alligators will take turns opening and closing their mouths while making a gentle chomping sound which your one year old will love! You’ll be happy to know that the paint used is child safe and the wheels on the push toy are non-skid, which makes this a safe Melissa and Doug toy for your toddler. 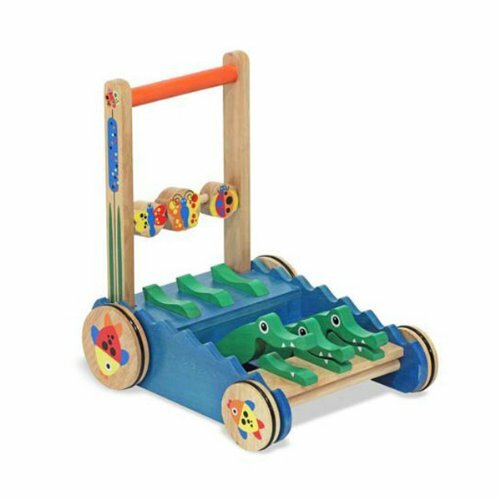 This is wonderful wooden push toy that any toddler would be delighted and excited to receive on their First Birthday, at Christmas or any occasion really. Several parents shared that they would highly recommend this Melissa And Doug Alligator Walker, that the loved the design, loved that it’s made from wood, and most important, their 12 month old loved it! Toddlers just love this chomp chomp alligator walker and have great fun playing with it! Both parents and 1 year old simply adore this beautiful soft, cuddly, huggable Melissa And Doug Plush Burrow Bunny Rabbit and who wouldn’t! This gorgeous bunny has long floppy ears, brown and white silky fur, cute brown nose, sewn-in black eyes, and super cute paws that your child will want to wrap themselves around! Perfectly suitable for boys and girls, this cuddly bunny is 9″ tall when he is in a seated position and is 14″ tall when he is laid out flat. This is an ideal size for young toddlers to easily carry around. Several parents shared that this Melissa & Doug Bunny quickly became a firm favorite and trusted companion for their one year old, that they wouldn’t go anywhere without him! 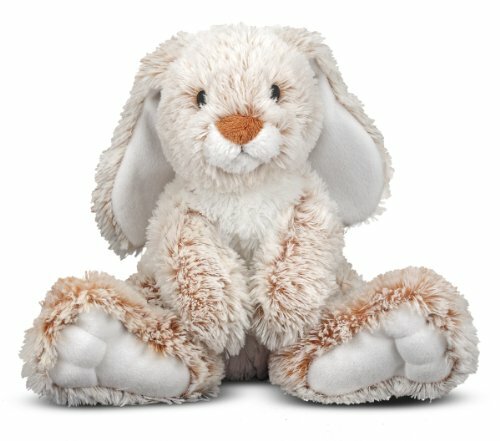 Kids just love this adorable huggale bunny with his soft fur and floppy ears! Idea travel toy for all kinds of trips! 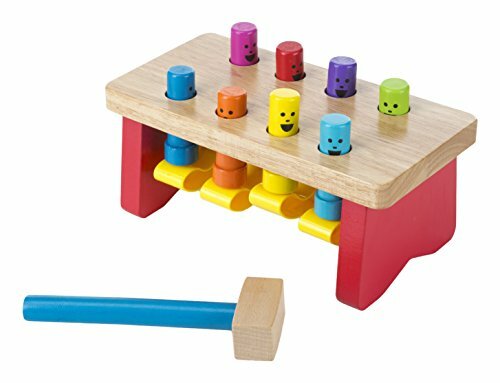 This colorful Melissa And Doug Deluxe Pounding Bench is the perfect gift for 1 year olds who love the fun and excitement of using a mallet to pound! Made from wood, this pounding bench will captivate and hold your child’s attention for hours while you get on with chores and more. It comes with a colorful wooden mallet and as your toddler pounds on a peg to push it down, other pegs will pop up! It’s like a game of peekaboo and hide and seek all rolled into one! You will hear your toddler laughing out loud as they try to pound all of the pegs only for more of them to appear with their smiling faces! Suitable for girls and boys, this Deluxe Pounding Bench from Melissa and Doug is a very interactive and engaging toy that will keep your child entertained for hours on end. A number of parents shared that this was their one year old’s favorite toy, they loved the quality and felt it was great value for money. Toddlers love pounding the pegs and trying to hit them as fast as they can! Your child will learn about cause and effect as the realize that hitting one peg down will cause another one to pop up!